For those of you lucky enough to drive an executive saloon as your company vehicle, you’ll be well aware of Lexus. 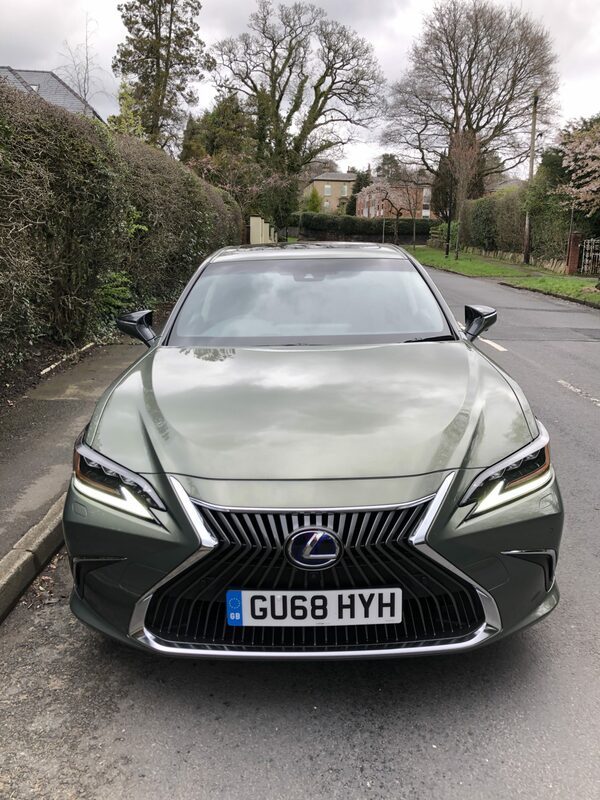 Lexus has been in the UK now for thirty years, when the large LS was the offering & in that time, has proved to be the choice for customers who put comfort, quality & customer care above driving dynamics. 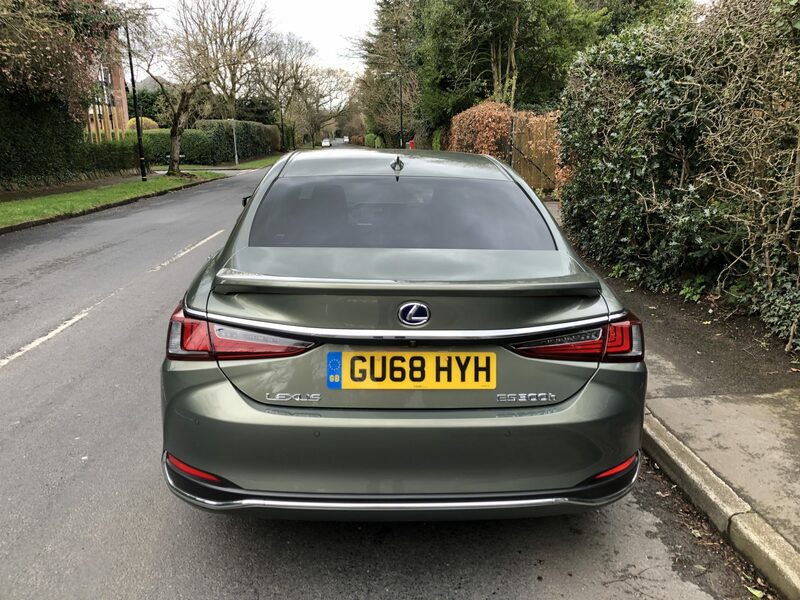 The latest large Lexus saloon to hit our streets is the ES, which offers buyers the opportunity to have a hybrid executive car, a middle ground between petrol/diesel & the EV offerings on their way from Germany very soon. The ES is actually a new name in Europe. Launched at the same time as the LS, the ES has become the firm’s biggest selling model, shifting over 2.3 million units. In Europe & the UK, it replaces the GS, which I always liked & comes with just a single hybrid powertrain. The new model uses a new 2.5-litre four-cylinder petrol engine which unlike the GS, powers the front wheels. This is combined with the Toyota/Lexus electric motor which together offers 215bhp. There are four models in the ES range; ES from £35,150, ES Premium Pack from £38,650, F Sport from £38,150 & range topping Takumi, the model we tested ,from £45,650. 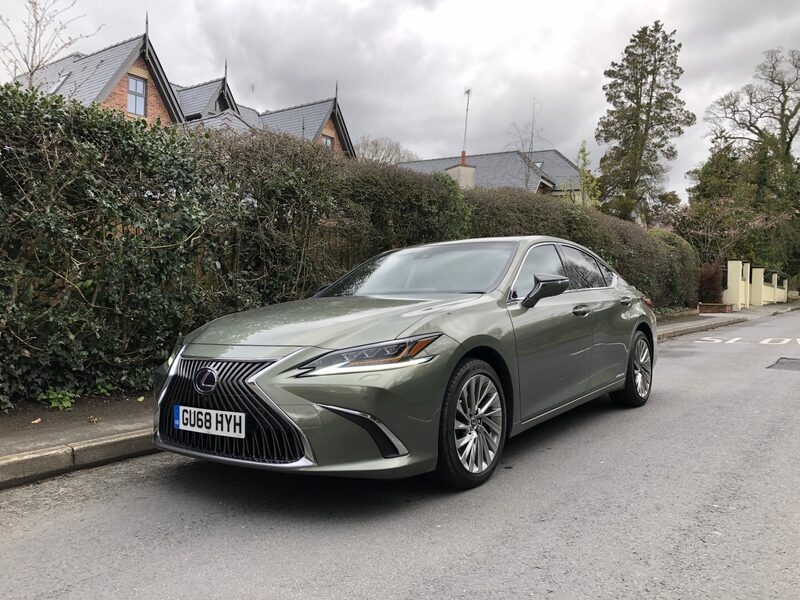 First & foremost, the ES looks good, with an aggressive sloping front end featuring Lexus’ signature zigzag front grille, wrap around headlights, a sleek roofline that curves into the rear window, all finished off with a snub nosed boot lid. Inside, the ES displays all of the quality that customers have come to expect of Lexus. High quality, soft touch plastics adorn the dashboard & door panels, with a touch of Shimamoku wood here & there,as well as on the steering wheel. Design details include two cylindrical buttons above the steering wheel which jut out like horns from the dash, one of which controls the driving functions, Normal, Eco & Sport; the EV function is selected by pressing a button between the front seats. 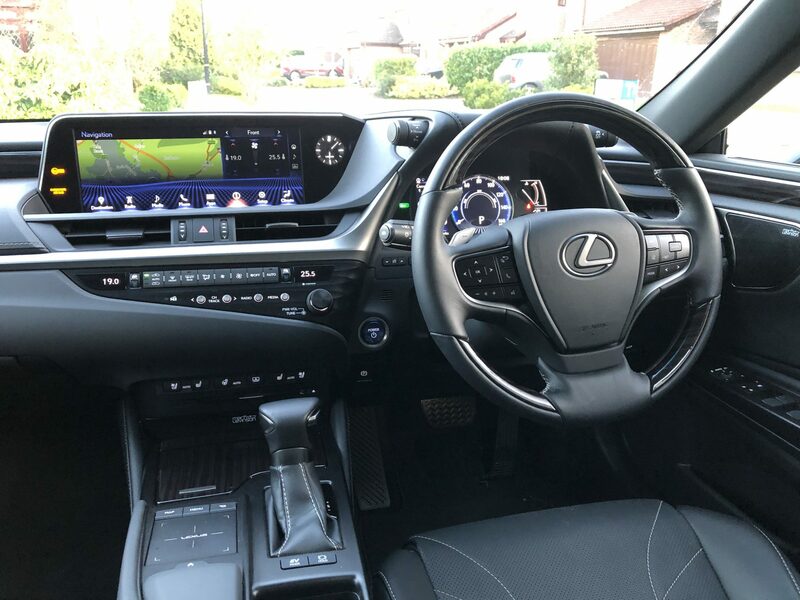 The dash is dominated by the 12.3″ multimedia screen with remote touch interface, featuring Lexus The Takumi spec features heated leather seats & a heated steering wheel with these switches also mounted on the centre of the dash. Both up front & in the rear, passengers will want for nothing. The ES offers plenty of space, with acres of rear leg room. The seats are lovely, finished in supple leather. There’s a drop down armrest in the rear with two cup holders & in the front, two more cup holders in the centre console, a front centre arm rest with storage which can be opened from the left or the right & two decent sized door pockets. The front seats offer 10 way adjustment with memory function included. The boot opens & close with an power button & for storage, offers up a useful 454 litres. 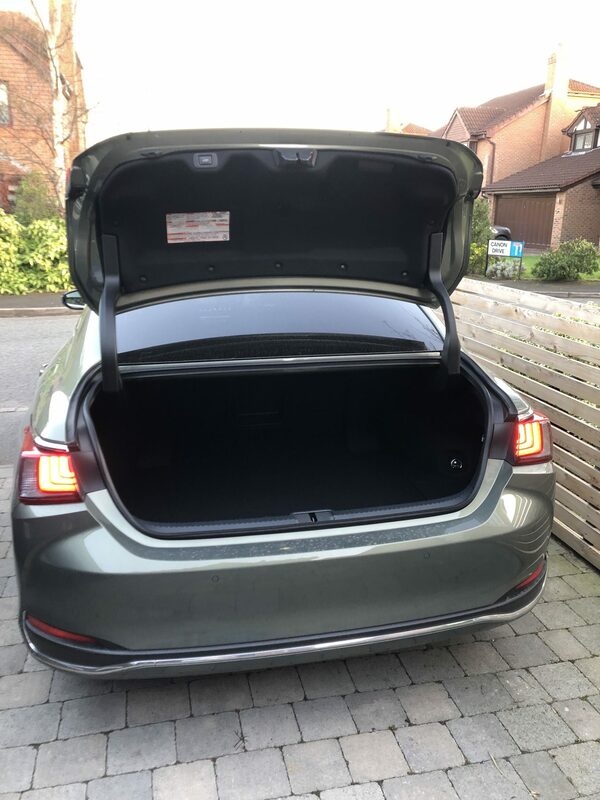 Access to the load space is good & there’s a flat bottom to the boot floor as well, with some storage on offer underneath. Being a Lexus, safety features are second to none. The ES features the Lexus Safety+ system with Pre Collision Safety, Adaptive Cruise Control, Lane Keep Assist, Sway Warning, Road Sign Assist & Adaptive High-Beam Assist. And there’s also, VSC, Traction Control, Hill-Start Assist, Rear Cross Traffic Alert & a Blind Spot Monitor. The Takumi comes with a Mark Levinson 17 Speaker Audio System, which is sublime. I undertook a 7 hour motorway round trip in the ES & loved the sound from the DAB radio & the Bluetooth connection to my i Phone was remarkably crisp & clear. It’s a different story around town though. The CVT gearbox coupled with the hybrid powertrain, do not offer any real driver-car interaction, the kind you’ll find when you drive a BMW 520d for example. Go hard on there throttle & the revs leap & the engine roars, but not much else happens even in Sport Mode. There’s just no mid-range torque to excite & even with a claimed 0-62mph time of 8.9 seconds, there’s a genuine lack of overtaking ability as well. Despite this lack of thrills, when you actually stop & consider the model’s fuel economy & C02 emissions, things become an awful lot clearer. 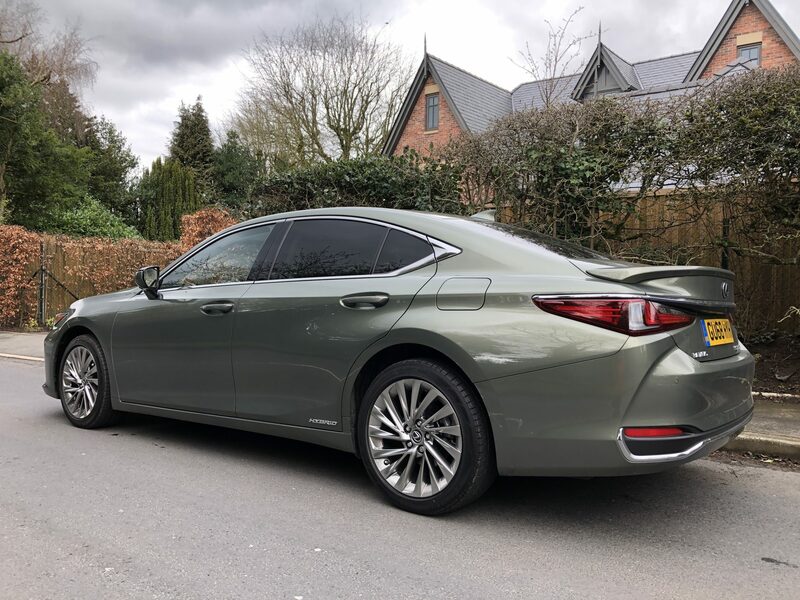 It’s not been designed to out grunt a BMW, Audi or Mercedes, it’s actually been built to be a comfortable, frugal & cost effective executive saloon. With a BIK of 25%, a combined fuel economy of 48.5 mpg & CO2 emissions of 103g/km, what it will do, is save you money. Indeed, without trying & driving in Eco mode, our 500 miles of motorway driving, saw us average 48.5 mpg, which was highly impressive,with this figure only falling slightly to 47.2mpg , after some short, urban journeys later in the week. When the time came to hand the ES back, I was quite frankly disappointed. Whilst not being a thrill-a-minute motor & definitely not being as engaging as the German competition, it does manage to pull off the trick of being incredibly relaxing to be in, whilst at the same time, surrounding you with some serious top notch fixtures & fittings, further enhancing the fell-good factor. Only the CVT gearbox & the lack of phone connectivity let’s the ES down. Despite these misgivings, if you’re all about saving yourself a bob or two, do an awful lot of stressful long driving, then the ES really is a no brainer.